The first meeting we have with you, the client, is to establish your vision, discuss your ideas and to get an overall feel for how you see your future garden. Before proceeding with a design, a full survey of the garden is undertaken; including boundaries, existing buildings, trees, levels and other important elements. We provide you with a few concept designs to discuss. 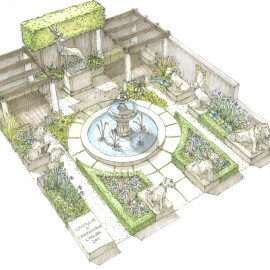 The purpose of this stage is to incorporate your brief into initial design layouts to convey the feeling of the proposed garden. Presentation plans are drawn up with full details of hard landscaping, features and design elements to bring the overall design to life. We use a mixture of hand drawn and computer generated designs. We will provide all detail construction drawings required to build the garden. This could be anything from standard retaining wall drawings to a bespoke water feature. The detail drawing pack may also include layout drawings for ducting for irrigation and electrics as well as a full lighting plan including specifications on fittings. Each project is individual and installed precisely to your requirements. A detailed planting plan and plant list is drawn up showing the placing of each individual plant and its eventual size as well as advice on its care. In order that our high standard of finish are met we would recommend that our team of skilled builders are used to create your garden or that we are involved in the supervision of the project throughout the build. Tom will be involved throughout the process : Sourcing and selecting the plants, laying the plants out on site and supervising or doing the planting. We also provide an after care package if required. This would involve looking after and maintaining your garden so that it continues to give you pleasure year after year. We can also simply provide a refreshing update for your existing garden with planting plans for a bed you want to change, designs for a lighting scheme or window boxes or planters for your front garden. Please contact us to discuss any of your requirements.